About 12" (30.5 cm) wide and 12" (30.5 cm) tall. 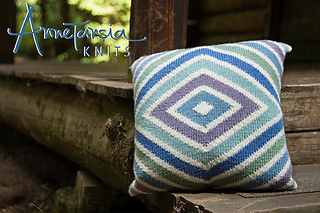 The yarn was the inspiration for this pillow design. 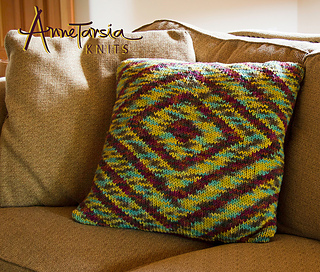 Pediboo is a bouncy, soft yarn that promised to be an irresistible pillow. Yarn packs with coordinating colors are available from Frog Tree Yarn, which is very convenient when you need several colors. The soft pale colors in this particular color group reminded me of the Oregon Coast—Cannon Beach and Seaside are two of my favorite coastal towns. 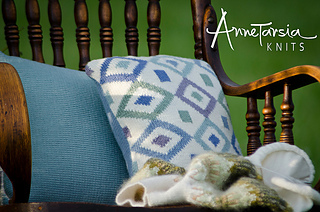 You can make one pillow with a different charted pattern on each side, but you’ll only be able to see one motif at a time. 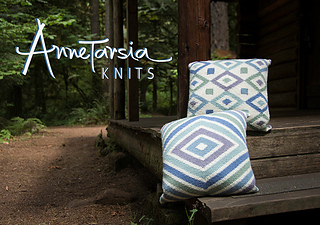 The yarn pack contained enough yarn for several pillows, so I knitted the backs in solid colors and made a separate pillow from each chart. 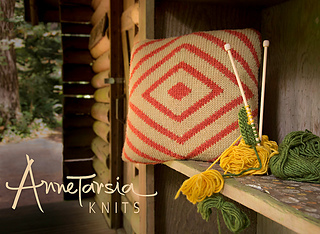 Whether you select yarns from stash, or search for the perfect yarn to accent your décor, you’ll end up with a unique statement.